Gananda Central School District employs professional drivers, mechanics and monitors who are trained to treat safety as their primary responsibility. Your children are most important to us. To help promote safety for all student riders we have rules we must follow, including Federal and State Laws as well as Gananda Central School District Policy. There are also bus rider rules for your student to follow to help ensure a safe ride for everyone. 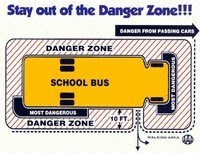 The Danger Zone is the space all around the school bus. It extends out 10 feet around the bus in all directions. The School Bus Driver cannot see you in this zone. The driver cannot see you around the wheels either. It is very dangerous to be in the Danger Zone. 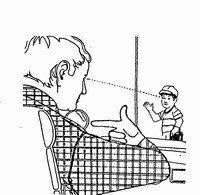 Always remain 10 giant steps away from the bus to be out of the Danger Zone and where you can see the driver and the driver can see you. Always cross in front of the bus with the drivers signal, NEVER go behind the bus. Always walk to the bus stop. NEVER RUN. Always go to the bus stop FIVE MINUTES before the bus is scheduled to arrive. Do not run and play while waiting for the bus. Never speak to strangers at the bus stop and never get into a car with strangers. Always go straight home and tell your parents if a stranger tries to talk to you or pick you up. Wait for the bus to arrive, watch for the red flashing lights and the stop sign to be extended, and cross only when all traffic has stopped. "I see the driver, the driver sees me." Wait for the bus driver's safe signal to cross. Go directly to a seat. Remain seated facing forward for the entire bus ride. Talk quietly (so the bus driver will not be distracted). If you need to talk to the bus driver: wait for the bus to stop, raise your hand and call the driver's name. If there is an emergency, listen to the driver and follow instructions. When getting off the bus make sure you walk (not run) three more steps away from the door. This is the best place to be around the bus. "Check before you step." Look for moving cars before you step off the bus and stay away from the bus wheels. Only get on and off your bus at your designated bus stop. If you need to get off the bus somewhere else, you will need to have a note from your parents and a bus pass to give to the driver. If you leave something on the bus, never return to the bus to get it. The driver may not see you come back and they may begin moving the bus. 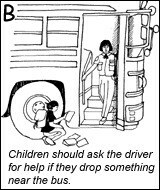 Also, if you drop something near the bus, tell the bus driver before you attempt to pick it up, so they will know where you are.